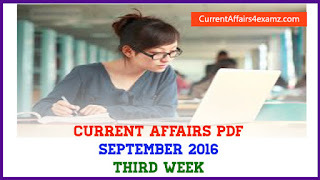 Hi Aspirants, here is the Current Affairs Quiz Questions for 11 September 2016 useful for all upcoming exams. 1. The 2-day Indo-US Economic Summit will begin on 13 September 2016 at? 2. Bakytzhan Sagintaev was recently (Sept-2016) appointed as the Prime minister of which country? 3. 11 September is the birth anniversary of freedom fighter, human rights activist and spiritual leader _____? Note: The father of the Bhoodan or Land Gift Movement, a freedom fighter and spiritual leader, Vinoba Bhave was born in Kolaba district, Maharashtra on September 11, 1895. 4. Who won the women's singles title of US Open 2016? 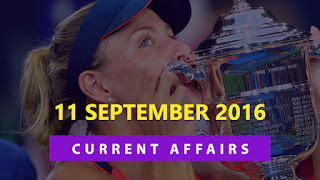 Note: German professional tennis player Angelique Kerber won her first U.S. Open title and the second Grand Slam trophy of her breakthrough season. The German defeated Karolina Pliskova 6-3, 4-6, 6-4. 5. Which country won its first-ever Paralympic gold medal on 10 September 2016 after para weightlifter Le Van Cong lifted 183 kgs, to set a new world record at the event? 6. Which team won the 2016 US Open men's doubles title? Note: Great Britain’s Jamie Murray and Brazil's Bruno Soares won their second Grand Slam doubles title, defeating Spaniards Pablo Carreño Busta and Guillermo García-López 6-2, 6-3. 7. Angelique Kerber on 10 September 2016 became the first German to win the US Open since Steffi Graf in? 8. Which foreign Bnak has recently received approval from India's regulatory authorities to open a branch in the country and begin operations? 9. Mariyappan Thangavelu, who won gold medal at 2016 Rio Paralympics Games, is associated with which sports? 10. Which state has recently become the first Indian state to roll out “Twitter seva”?